I’ll admit, I forget to have my son take his vitamins but it can be so important so they don’t miss nutrients they need. 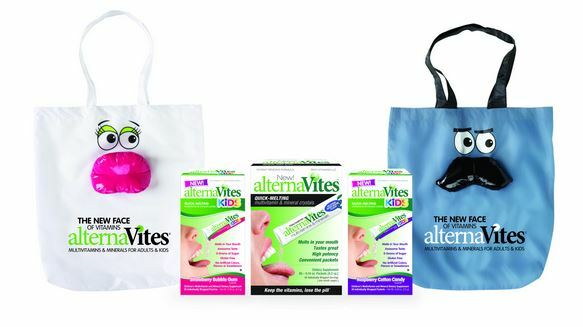 AlternaVites are a great and fun way for kids to take their vitamins. If you remember, we done an alternaVites review over a year ago. Be sure to check it out and see exactly what the Bandit thought of them and see if they get our stamp of approval. Want to see if your kids like them? Here’s your chance to enter to win an awesome prize pack for them! Forget chalky chewables and sugary gummies vitamins that are often missing nutrients and are prone to sticking to children’s teeth. Jam packed with nutrients kids need, but without the sugar & additives they don’t, new alternaVitesKids multivitamin & mineral will have moms and kids cheering! The winner and a friend will each receive a Celebrity Gift Bag, just like the one distributed to celebrities at a Pre-Emmy Gift Lounge. Contains adorable tote bag, 2-month supply alternaVites Kids mutivitamins, kid’s activity booklet, fridge magnet picture frame and colorful pen. The Giveaway will open up on 1/7/14 12:01 am EST and Close on 1/10/14 at 11:59 pm EST. Open to US only.